Daytonian in Manhattan: The 1843 Governor's Island "Admiral's House"
Well before the eruption of the Revolutionary War, the incalculable defensive significance of the island in the middle of New York Harbor was recognized. The Dutch, the British and now the rebelling colonists all maintained fortifications here. After the Revolution, military structures continued to be built. Fort Jay, surrounded by a 13-foot moat was constructed in 1806 and one-by-one additional buildings were erected to accommodate the military presence. 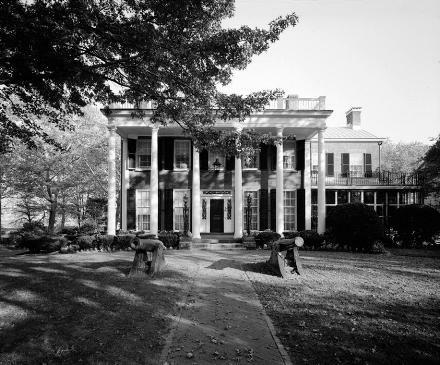 The United States Army took possession of the island in 1821 and in the early 1840s commissioned architect Martin E. Thompson to design a residence equal to the status of its most ranking officer. 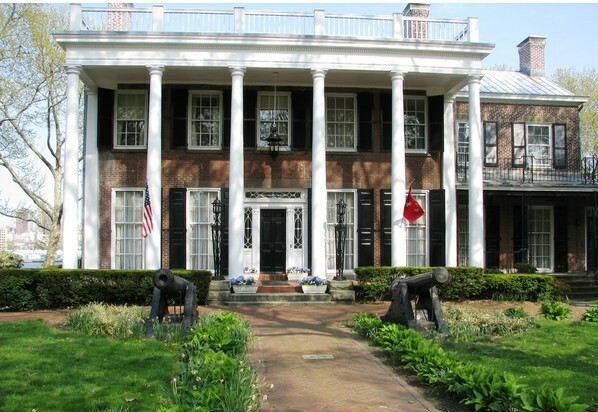 Called The Commanding Officer’s Quarters it was completed in 1843, a large brick Greek Revival home with a two-story porches, front and rear. Thompson created a Colonial Revival entrance with pilasters and flanking sidelights, a paneled door and leaded transom. The long, floor-to-ceiling windows on the parlor level gave added elegance to the interior. Walter Bedell Smith, Winfield Scott Hancock, Adna Chafee, Leonard Wood, Robert Bullar and Jonathan Wainwright. 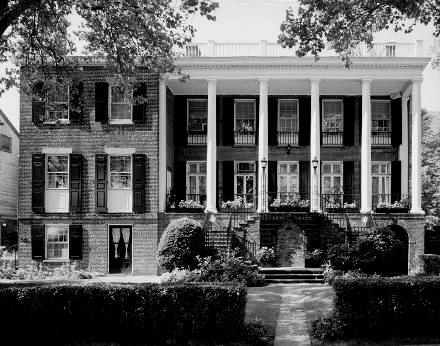 In 1886 the house was enlarged with an architecturally cohesive wing at the southwest corner and, later, the exterior was redesigned with the porches being replaced by wide verandas -- creating a plantation house effect. Again, in 1936, the exterior was renovated when Charles O. Cornelius removed the peaked roof, replaced the rear wooden porch elements with brick and added decorative ironwork. After addressing the United Nations General Assembly regarding "perestroika" on December 7, 1988, Soviet General Secretary Mikhail Gorbachev boarded a ferry to Governor’s Island to meet with President Ronald Reagan. The two leaders met in the Admiral’s House where the two worked out important steps to the end of the Cold War. Ironically, the subsequent Peace Dividend between the two countries resulted in the closing of the Coast Guard Base in 1966. The Admiral’s House, constantly occupied since 1843, was emptied. The Admiral’s House , although still eerily empty, is open to the public by the National Park Service.